The Science of Hugs: Nature’s Tranquility Booster | Choose Your Energy: Change Your Life! ← BOO! Time to Step Into Your Greatness! Scientists, doctors and moms tell us that we should receive at least three hugs a day. While we may know that the perfect hug, delivered at the optimal time by the right person (or anytime by anyone, if you’re a “hugger” by nature), can feel good, there’s considerable science behind the deeper benefits that has everything to do with the electro-chemical marvel of being in human form. 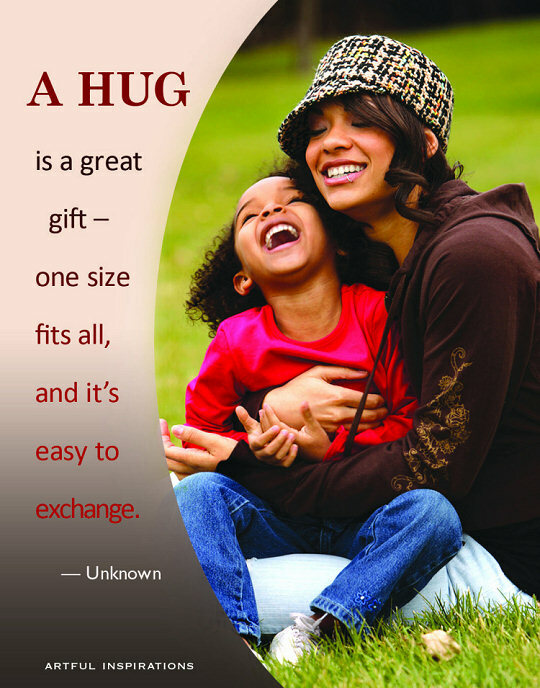 Hugs release an important hormone called Oxytocin. Among other benefits, Oxytocin relieves anxiety, lowers blood pressure and helps us feel calm, centered and better connected to the world around us. Hugs, and the Oxytocin they release, are so important that without them, our brains and bodies fail to develop properly and we become ill and malnourished. Studies have shown that babies who don’t receive sufficient compassionate touch are 78% less likely to survive infancy. One of the great things about hugs is that when you give one you also get one. A completely free, big-time win-win in which everyone involved truly benefits! Because people and cultures vary in their individual boundaries concerning physical contact, it’s always good to ask permission before giving a hug. Even someone you are close to and have hugged many times, may find themselves in a place where a hug just doesn’t feel comfortable. Once you have the all clear, HUG AWAY! It’s easy to do and fun to practice. With just a little effort, you can be a super hugger, appreciated by those whose lives you touch with hope, possibilities and empowerment as you foster the flow of Nature’s tranquility booster—Oxytocin—in the world around you! If you find yourself in need of a hug, ask for one! It’s a great example of caring enough about yourself to pay attention to what you are feeling and then taking action to support your optimal functioning in each moment. Like many of the best things in life, to reap the full benefits, you need to actually do it, not just read about it. So, quit reading this blog, walk away from the computer screen and GO HUG SOMEONE!